The Visayan warty pig is a small, forest-dwelling pig. Its diet includes cultivated vegetables and fallen fruits. It is usually found in groups of 4 - 5 individuals, with groups of up to a dozen individuals seen occasionally. 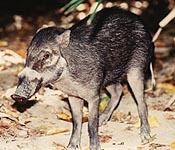 The Visayan warty pig probably was once distributed throughout the central Philippine archipelago (the Visayan Islands). Due mainly to intense hunting pressure and the continued elimination and fragmentation of its remaining habitat, potentially viable populations are now thought to remain only on two of the Visayan Islands: in the western mountains of Panay and in scattered fragments of surviving forest on Negros. *** There have been no detailed studies on the biology of the Visayan warty pig. It was only recently established as a separate species. *** The plight of the Visayan warty pigs is made worse due to the negative attitudes of most local people towards them, because of the damage they cause to the crops of small farms. As a result, not only is there a lack of conservation measures to protect the pigs, but they are regarded as pests and fair game for hunting. *** The range of the Visayan warty pig is essentially the same as that of the endangered Philippine spotted deer, which is subjected to the same threats. *** Much of the destruction of the forests of the Visayan Islands, which are home to this pig, may be attributed to landless peasants and indigenous tribal groups who move into these areas to clear temporary agricultural plots known as kaingin. The soil of these plots is rapidly exhausted and new plots must be cleared every few years. Tropical storms wash the sparse topsoil off of the bare hillsides into the sea (NFEFI 1998). *** The Visayan Islands are in the central island group of the Philippines, bordered on the south by Mindanao, on the west by Palawan, and on the north by Luzon and Mindoro. The main islands in the group are Panay, Negros, Cebu, Bohol, Leyte and Samar. High relief is typical throughout the larger islands and all have rugged interior uplands rising to 750 - 1000 m (2500 - 3300') . The coastal plains are seldom as much as 16 km (10 mi) wide, and drainage is generally by short, violent streams of immature development. The entire Visayan archipelago was once covered by dense rain forest, but vast areas have been cleared. 2004: Occurs in the Philippines (IUCN 2004). Little is known about the former range of the Visayan warty pig, but it was probably once distributed throughout the central Philippine archipelago (the Visayan Islands). In 1987 it was still thought to be found in the mountain regions of Panay, Negros, Leyte, Samar, Billiran and Bohol, but it was nowhere common. By 1993, potentially viable populations were thought to remain only in the western mountains of Panay and in scattered fragments of surviving forest on Negros. The major threats to the Visayan warty pig are population growth and the resulting accelerating rates of habitat loss and hunting pressure. The habitat loss is due mainly to the clearing of kaingin by landless peasants and indigenous tribal groups moving into the Visayan Islands, but also to poor logging practices. Only a few percent of the original primary forest remains on Negros Island (NFEFI 1998) . Widespread political unrest, the low priority accorded to conservation of the Visayan warty pig (because of the agricultural damage it causes) and the depressed state of the Philippine economy are contributing factors. The Visayan warty pig is a forest dweller. The Visayan warty pig is one of the species that live in the Philippines Biodiversity Hotspot (Cons. Intl.) . Piglets are usually seen in the dry season (January - March in the Western Visayan Islands). The average number of piglets is probably about 3 - 4 per litter. The Visayan warty pig's diet includes cultivated vegetables and fallen fruits. The Visayan warty pig is reported usually to be found in groups of 4 - 5 individuals, with groups of up to a dozen individuals seen occasionally. Solitary males are also reported infrequently. Arkive, Cons. Intl., Cox 1987, IUCN 1994, IUCN 1996, IUCN 2000, IUCN 2003a, IUCN 2004, NFEFI 1998, Oliver 1993, Quant. Cons. e. V., Spec. Cons. Found.